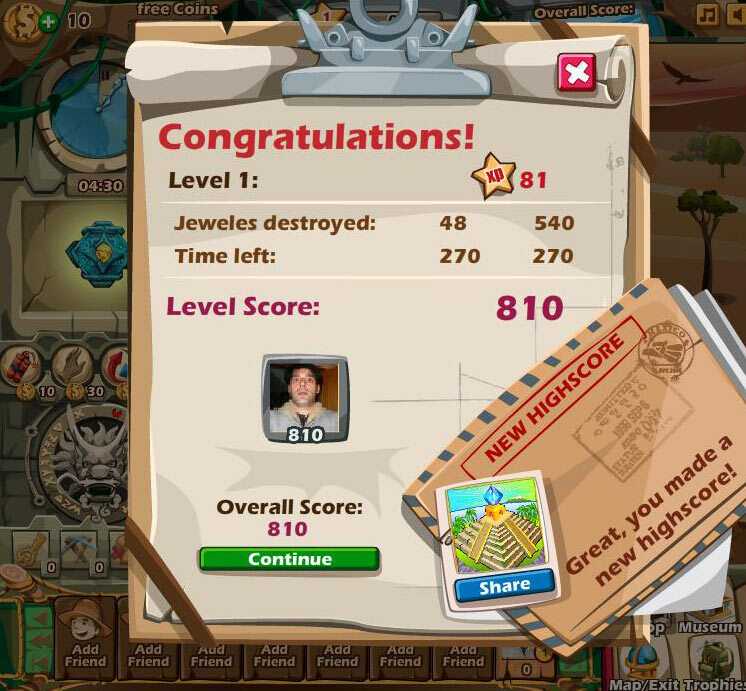 Jewel Journey is a match-3 game available on Facebook from the same developers of Mahjong Pirates. This title offers players a fresh new take on the game of Match-3. 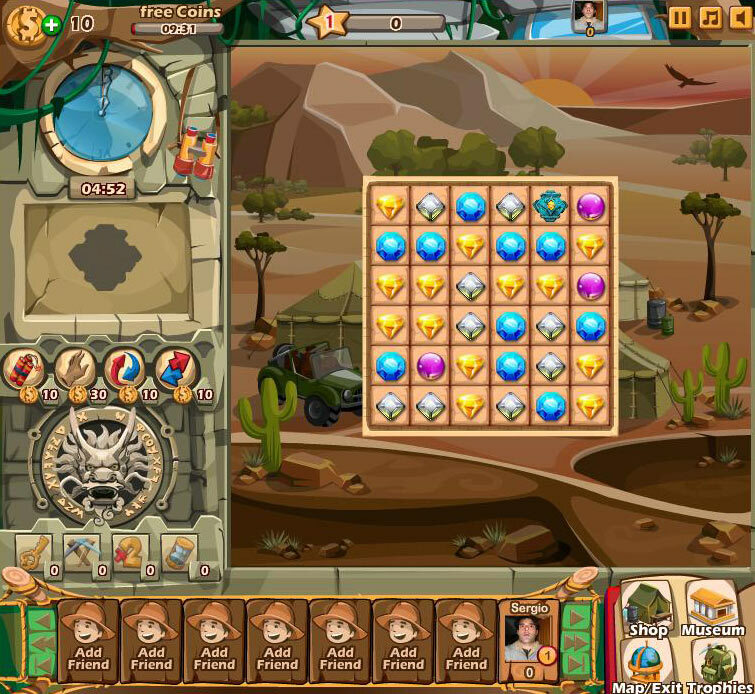 Travel to exotic lands and become a Master Archeologist while solving fun puzzles! With a great tutorial and help system, excellent graphics and gameplay, this is another great option for match-3 fans, available free on Facebook. For those not yet familiar with the match-3 genre, in Jewel Journey you have a limited time to swap jewels vertically or horizontally to form groups of 3 or more of the same kind, this is done by clicking on them. 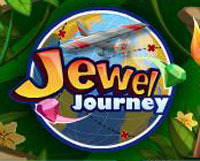 Jewel Journey adds a new feature, you have to move the broken key parts to the bottom of the screen to complete the master key within the time limit, and finish the level. Time is the most critical aspect of the game, you must bring down all the key parts before the time runs out. 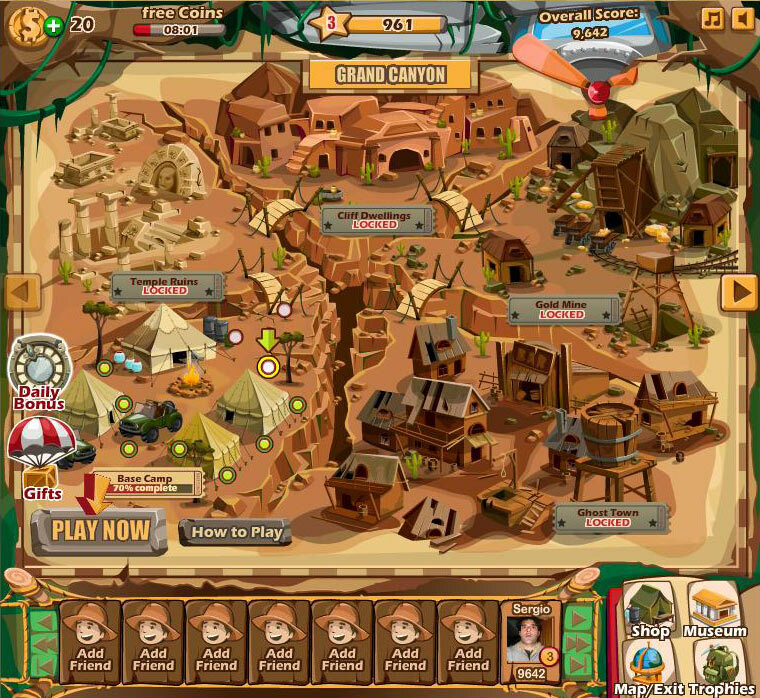 The game world is divided into regions, at the moment there are 4 main regions, Grand Canyon, Alaska Camp, Aztec Ruins and Lost Atlantis, each one is divided into smaller regions or stages, with several levels each, at the end of each stage you get a special artifact to add to your museum.To unlock this artifacts you need the keys collected from each finished level. In order to travel from region to region you’ll need to add companions (by inviting friends) or buy the map of the desired region from the store (the first one is free). All the treasures you find will be stored in your museum, you can also view your friends museums, this works like the usual collection system and serves to show your progress to other players. 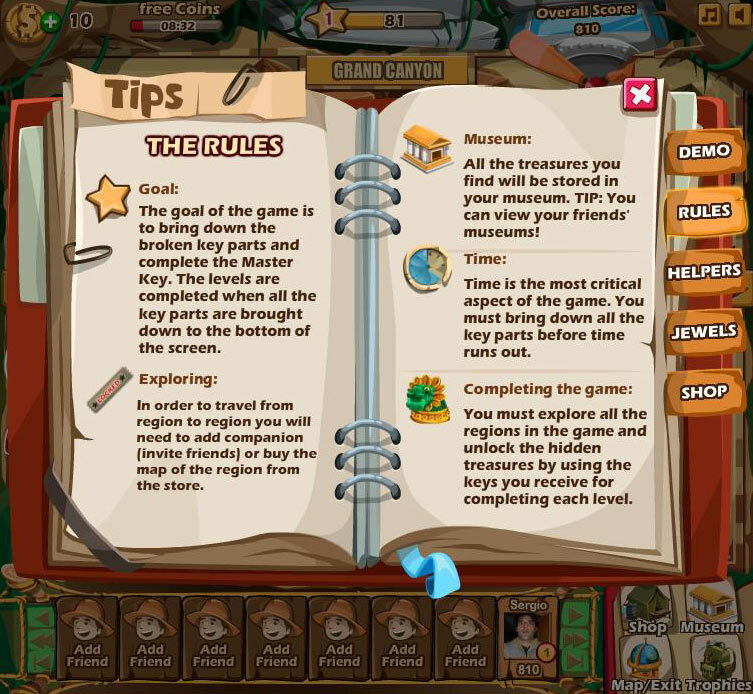 The Shop is located in the bottom right corner of the game, next the museum and above the Map/exit and Trophies. In the shop you can Maps for the next region, get new jewel set and backgrounds. As said before you can Buy or Invite friends to get the map for the next region, by having the map of a region you can play all the levels on that region. You can also buy different set of jewels to play the game. Each set looks different and awards different point per match. You can also buy different backgrounds and add some diversity to your game, by for example adding a background from the region you are playing. 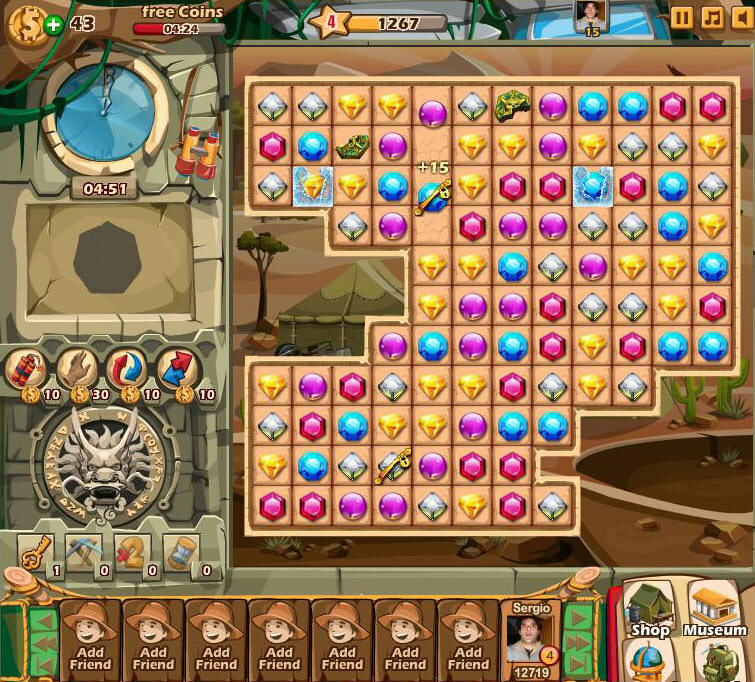 Locked Jewels – These can’t be moved until a match is made using the locked jewel. Yet if match are made bellow the locked jewel, this will drop down. Frozen Jewel – Much like the ones above these can’t be moved until a match is made with the frozen jewel, but if matchs are made below it, the frozen jewel will not drop down the game board. 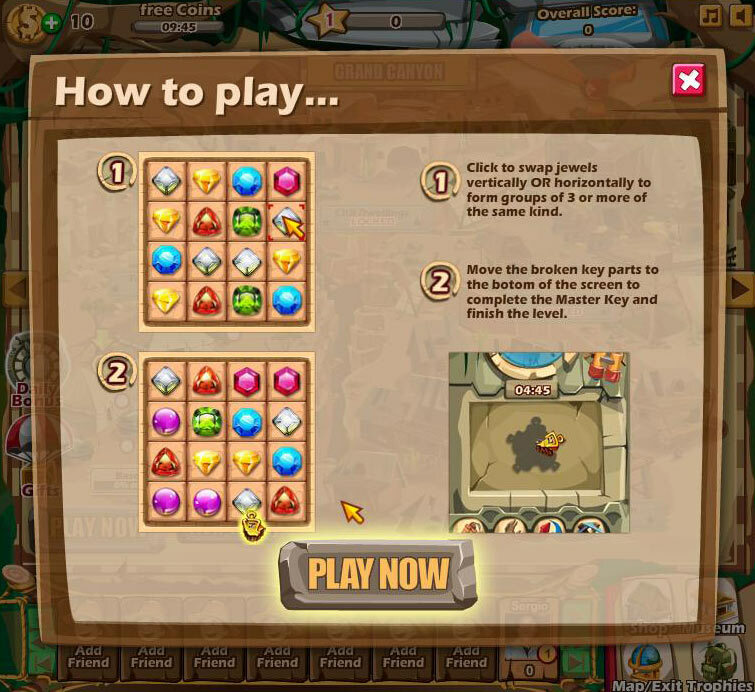 Bomb Jewel – When you match 4 jewels, you will see the bomb jewel under pressure and shaking. Hyper Cube – Matching 5 jewels will transform into an Hyper Cube, you can then match it with any type of jewels to make it explode. Fire Jewel – Any jewel can become on fire when you make an L shaped match of at least 3 by 3 jewels. 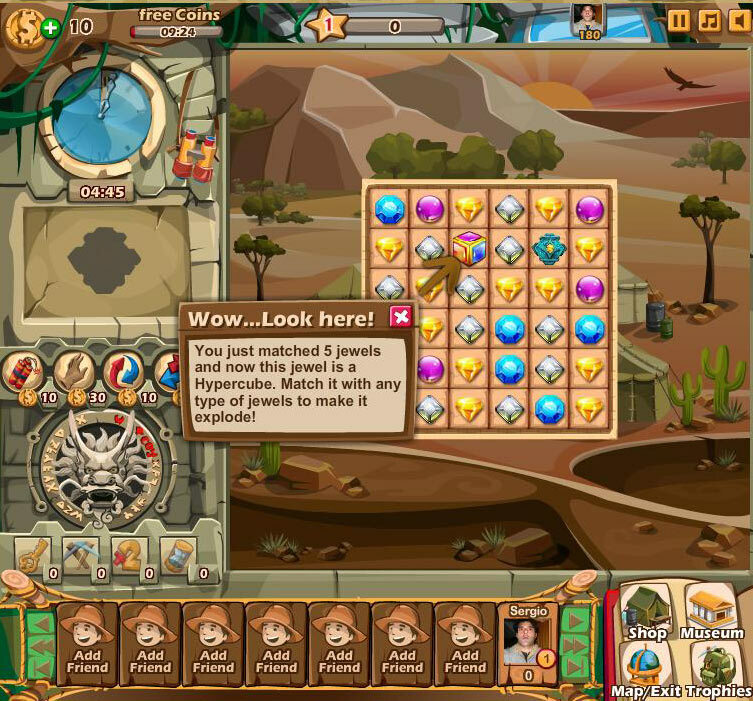 Swap – Allows to swap any two jewels except from the bottom row. You may also swap key parts. Bonus multiplier – Increases the total points accumulated in a level by a factor. For example X2. Time – Adds extra time to the level, allowing you to play some more time. Facebook Page – Visit their wall to add friends, comment and get the latest news.